You often see lazy daisy stitch (or detached chain stitch) used to create little embroidered flowers but it is a much more versatile embroidery stitch than you might first think. Here I used it to make a cute little strawberry for my Strawberries and Cream crazy quilt block. I thought you might like to see how it was made. If you haven't tried lazy daisy stitch before you might want to look at my page on chain stitch embroidery to see how it is worked. The great thing about free-style embroidery is that you do not have to rigidly stick to particular thread colour numbers. Just pick colours that you feel go together to stitch your strawberry. I used an overdyed floss from Needle Necessities in dark reds for my first "layer" of stitches, followed by a medium red mixture that I got in a bag of threads from a charity shop for the next layer. I finished it off with a variegated pink/white stranded cotton from DMC. Then some flower thread yellow french knots were worked on top, and I used an overdyed perle in greens for the woven picot sepals. The nice thing about stitching strawberries, in lazy daisy stitch or any other, is that they are simple to draw! I took a disappearing ink pen and sketched out the shape on my fabric. In fact I realised that I had made it too long at first so redrew the bottom to make it a little shorter. The first drawing lines were not a problem as the ink fades within 48 hours. If you look really closely at the photograph above you may just see the remnants of my first sketch as I took this photo as soon as the berry was finished. 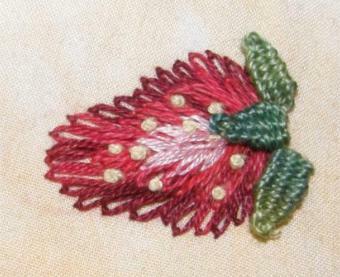 I started the stitching near the bottom end of the strawberry, as shown by the arrow in the photograph, using 2 strands of floss. 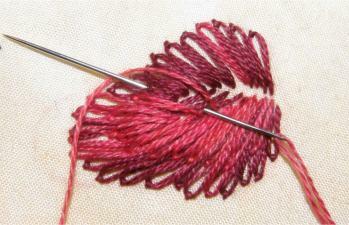 Take long stitches right to the outline you drew, remembering to keep the thread under the needle. 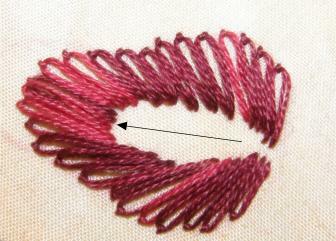 Then anchor each stitch down with a tiny stitch just outside the outline. To begin with I kept the stitches at the same angle and close together. Then as I worked my way around the shape I spaced them further apart and followed the curve on the outside, moving up the centre of the strawberry until I reached the top. To help create a raised effect in the centre of my strawberry I took a few straight stitches in the empty central area in the same thread as the bottom layer of lazy daisy stitches. 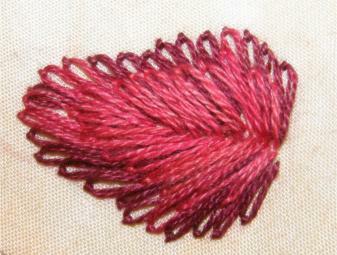 Changing to a lighter coloured thread, (this one was thicker so I only used a single strand) I began the second layer. Each one of these stitches overlapped the previous layer by about half way. 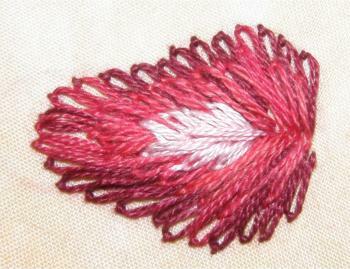 This time I began each stitch right down the central line of the strawberry, without leaving a gap. I took some stitches across that central line to help blend them in to each other and soften the line down the middle a little. The photo above shows this step completed. The third layer of stitches is again worked over the top, using a lighter coloured floss. This creates the highlight area where the light is catching the berry. The last stitch is then taken down the central line of the strawberry. Then all that is left is to stitch some French knots for the seeds, in yellow or black. I added sepals made from needlewoven picots and will also add a stem and perhaps tendrils to the top of my strawberry. I do hope you will try making a strawberry from lazy daisy stitch yourselves. If you do I would love to see your results!